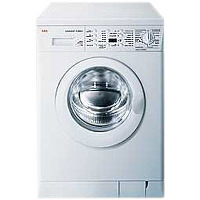 AEG Oko Lavamat Turbo 16800 Review I like the convenience of a washer-dryer combination. But having owned several British-made washer-dryers which proved to be unreliable and expensive to get repaired, I decided to spend some extra money on a German-branded washer-dryer with a reputation for quality. I settled on the AEG brand because I liked the quality looks and the features. I chose the Oko Lavamat Turbo 16800 because it offered a 1600 rpm spin-speed as well as auto-sensing of moisture to stop the drying cycle automatically. There are two automatic moisture levels which can be selected: ready-to-iron and ready-to-store. Another must-have feature for me was a built-in digital delay timer which allows me to program the washer-dryer to run when my electricity is at the cheapest rate. The timer can be set for delays of up to 19 hours in increments of 1 hour. This machine has been very reliable. It has not had any faults and it is now nine years old. I have been so impressed with it that I bought a second one to install at a rental property I own. That machine gets much more use than mine and it has also been very reliable. There was just one fault when a pump blade was broken and I think this was because the tenant's child had a tendency to put small toys in the machine when her parents were't watching! At this point we must need some helping things to make life easy or durable here are essay mania site which must make our life easy or convenient for us. Great post! Thank you for sharing this type of post. I would like to invite you my site about essay writer service. I think all student get benefit from our site. Thank you. Second, I'd prefer to wonder wherever I can learn a lot more info concerning your post. I arrived right here via Bing and can't discover any associated web websites connected to this matter. How do I sign for your web blog? I had prefer to stick to your updates as they arrive along! I'd a query to interrogate but I forgot what it absolutely was... anyways, thank you very much. I am using AEG Oko Lavamat Turbo 16800 for more than six months. I never faced any problem with it and it is working fine. When I decided to buy a new machine with higher capacity essay services helped me to find the suitable one. I agree with your comments that operating cost is very high. That is the only disadvantage with AEG Oko Lavamat Turbo 16800.